I wanted another simple bread today that would be good for sandwiches. I came upon this recipe and it sounded perfect. I decided late last night to make it, and because I was able to use buttermilk powder, it was a perfect loaf for my delay timer. I loaded the liquid ingredients into my machine first: 1 cup plus 1 Tb water, 1 1/2 Tb melted unsalted butter, and 3 Tb maple syrup. On top of the liquid ingredients, I added, 3 cups of bread flour, 1 Tb gluten, and 1 1/2 tsp salt. Since I wanted to be sure to keep the buttermilk powder and yeast from mixing with the wet ingredients too early, I added them last. 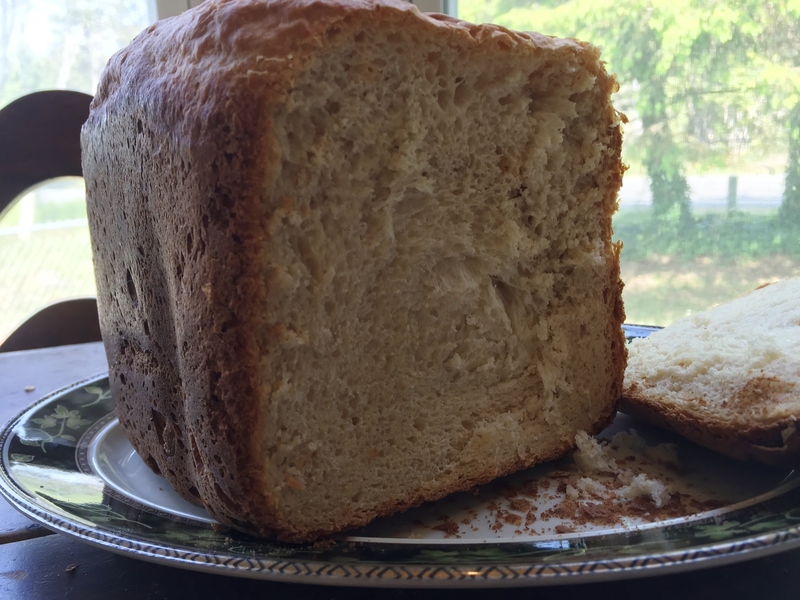 1/3 cup dry buttermilk powder and 2 1/4 tsp bread machine yeast rounded out the ingredients. I set my delay timer to have a fresh loaf for lunch today, and headed to bed. This loaf has risen nicely and is baking now. The tangy smells of buttermilk and yeast are filling the house and I am itching to get a slice. Ooooh, it just finished and I removed it from the pan to a rack to cool. I haven’t mentioned it before, but be sure to remove your loaf from the pan promptly to keep it from getting moist and soggy. After cooling to room temperature, the bread is ready for slicing. 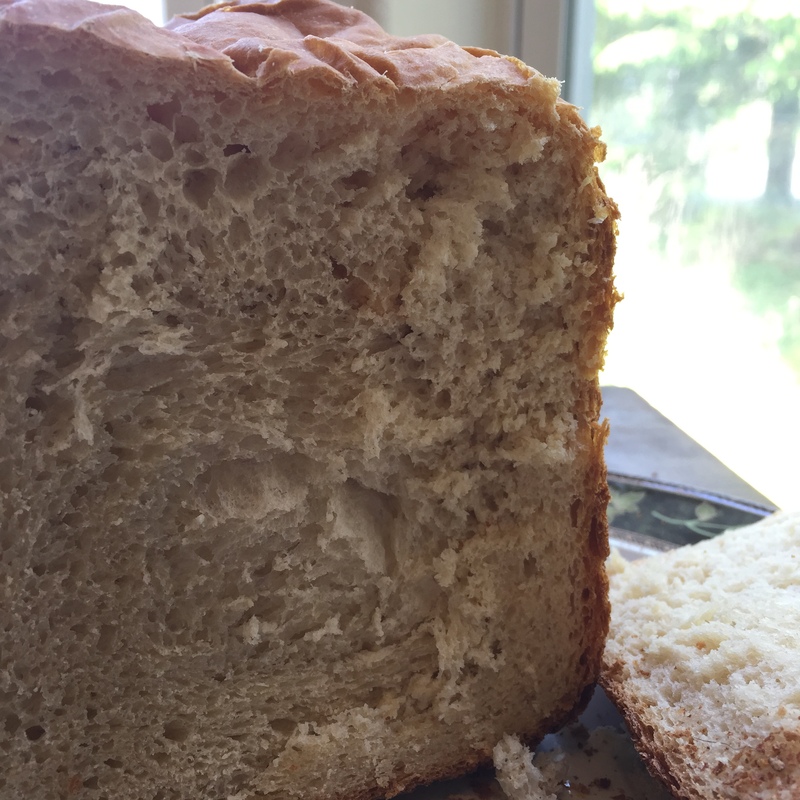 The bread is soft, with a nice, golden brown and flaky crust. The maple flavor isn’t prevalent, which may be because I used a grade A maple syrup. The buttermilk, however, has created a delightfully tangy and moist loaf. This is a recipe I will certainly make again. I am getting together with a group of friends this weekend for a tea party and found a couple recipes for loaves that I think will go nicely with our theme. 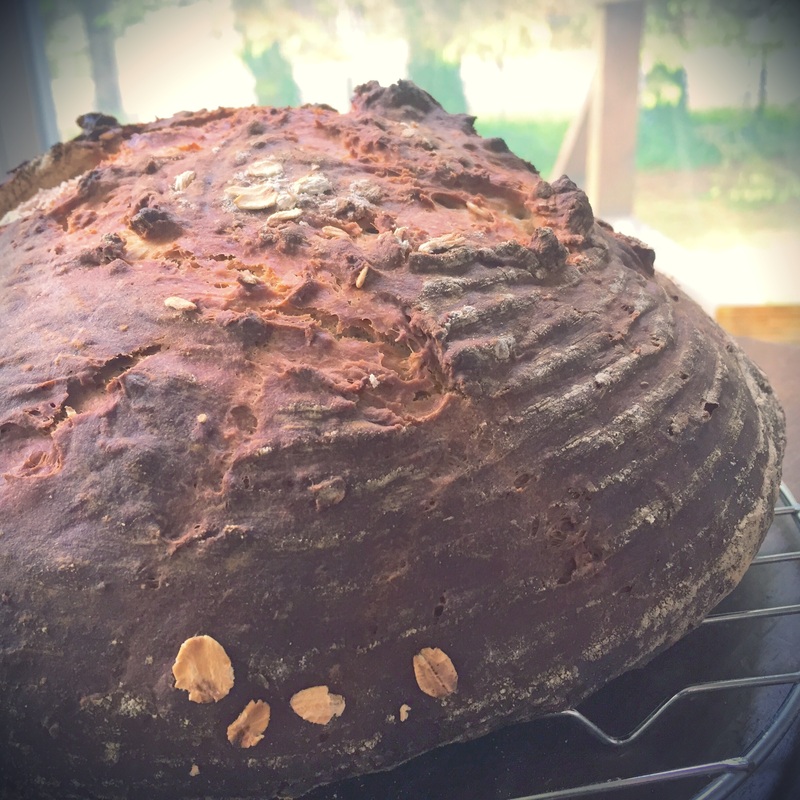 The first being this maple oatmeal bread. Doesn’t that just sound like it needs to be served with a cuppa? Since I am making two different loaves for the party, I am starting this loaf in the bread machine, but will finish it off in the oven. That way I will be able to manage two loaves today, and be able to use my banneton for the first time. I hope this recipe works in it. A banneton, if you don’t know, is a wicker or wood basket used to proof artisan loaves of bread during the final rise. The dough is then removed from the banneton, slashed and baked. 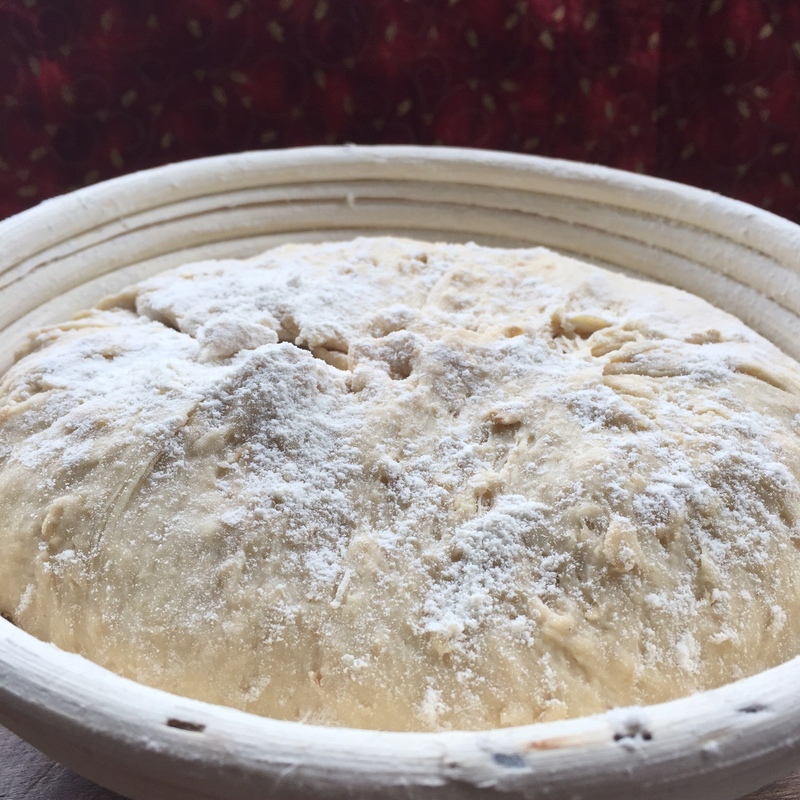 A few tips, if you are using a banneton: it needs to be kept dry and well-floured. You don’t want your dough sticking to the basket after the rise. It will still bake fine, but you will lose the design, and likely part of your dough. When cleaning your banneton, use a brush to remove leftover flour, but do not immerse in water to wash. Ingredients for this loaf are buttermilk, maple syrup, unsalted butter, bread flour, rolled oats, gluten, salt and yeast. I am using buttermilk powder so I placed my ingredients in the bread machine in the following order: Water, maple syrup, butter, flour, oats, gluten, salt, buttermilk powder and yeast. The recipe says this is not a suitable loaf for using your machine’s delay timer, this is because of the buttermilk. My machine has a dough cycle that also works for making pasta dough. Another nice feature is that the regular bread cycles also alert you when the dough has finished its first rise, in case you change your mind and decide you want to shape and bake the bread yourself after you have started the machine. The dough cycle just finished. 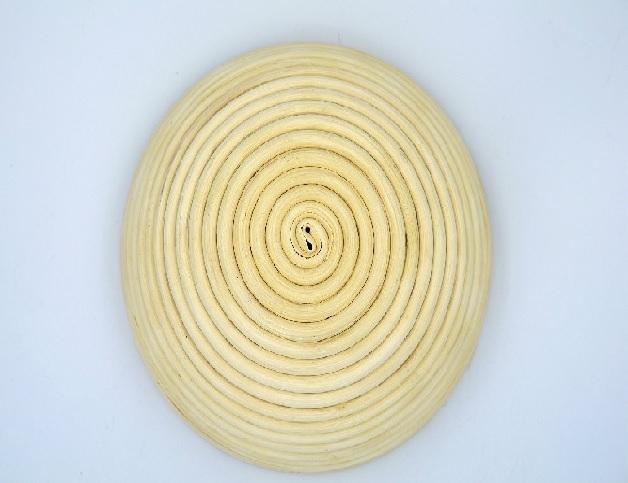 I placed the dough onto a lightly floure d board and shaped it into a boule. This is basically just stretching the dough across the top and tucking underneath to make a ball. Now the dough ball needs to rest for 5 minutes or so. While the dough is resting, I will prepare the banneton. 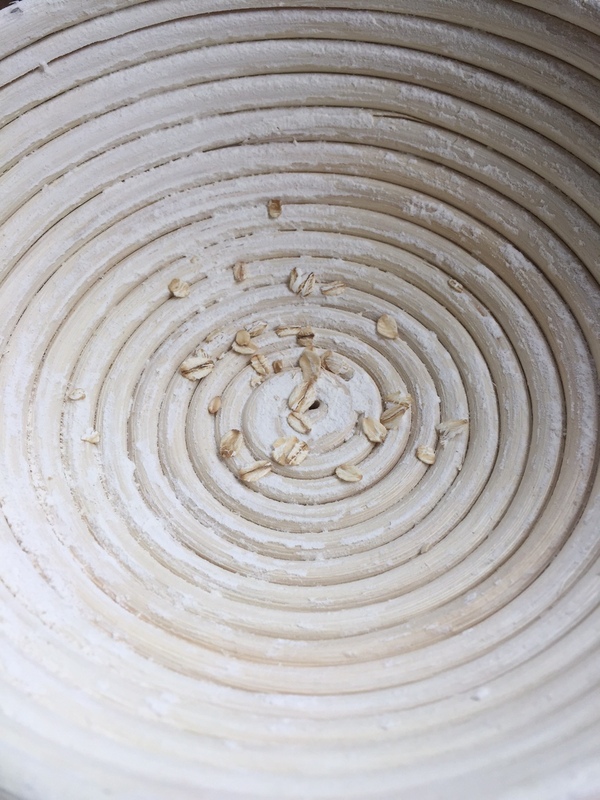 The banneton needs to be well floured before baking and because I am baking an oatmeal bread, I have decided to sprinkle a few oats onto the bottom of the basket. 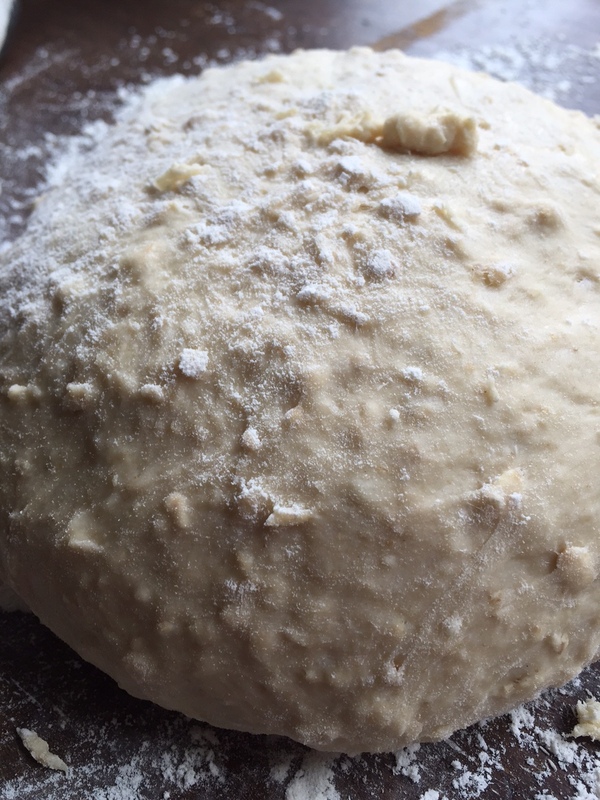 After the dough has rested, it needs to be reshaped. Same method applies as before, stretch and tuck the dough until you have a nicely shaped ball. Place the dough into the banneton, smooth side down. Pinch together the ends of the ball. Sprinkle lightly with flour and cover with a clean, soft cloth. Leave the banneton in a warm area and allow to rise for 1 hour, or until the dough has doubled in size. After the final rise, I needed to preheat the oven and baking stone while turning the dough out of the banneton. 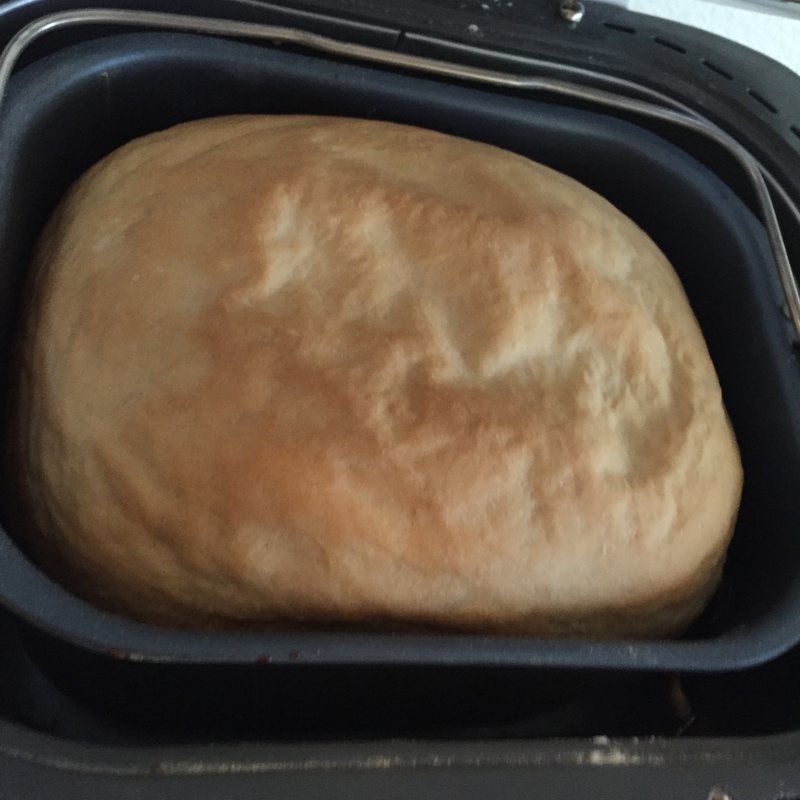 I also placed the bottom of my broiler pan in the oven to allow steam to circulate while my bread bakes. I have seen a couple ideas for turning the dough out of the banneton. As I am preheating the baking stone, turning it directly onto the stone might cause me to burn my fingers. Other suggestions include using a pizza peel (which I don’t have) or turning it onto parchment paper and then transferring it to the baking stone. I turned the dough out onto a piece of parchment paper on my board and then needed to cut slashes into the top of the loaf. This didn’t go as smoothly as I had hoped, I don’t think my knife was sharp enough to make a clean cut. I didn’t think to get a photo at this point, but I will certainly have pictures of the final result. I then transferred the boule to the baking stone, turned on my timer and now I wait. It already smells great. I realized that I am really torturing myself today, as I am baking two kinds of bread and not planning to use them for a couple days. This lovely smell will just have to tease me. The loaf came out dark, I could try and play it off like that was my intention, but no. Because I was converting the recipe from bread machine, to oven boule, I must have misjudged the temperature. I simply had the oven too hot. The loaf is hardly black, though, and still looks and smells tasty, so I think it will work well for this weekend’s party. I will have to come back here to update this post after it has been tasted.